Last night's SmackDown followed up its older red counterpart in delivering a program full of filler. 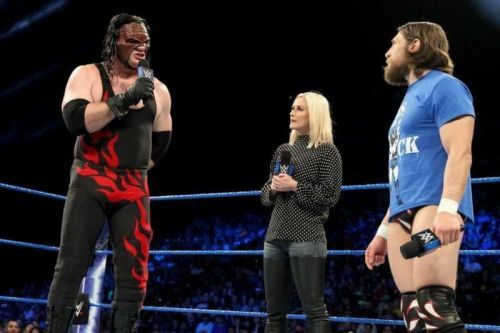 Even if Team Hell No's reunion was a highlight, it was anticlimactic last night. There was little that added to the build to Extreme Rules, even if the matches delivered more than Raw's did the night before. That didn't stop them from being filler, though, even if some of them were high in quality. When watching the episode, can you honestly say that you're more excited for the Extreme Rules card than you were before? Like many of you, my answer is "no." The show was better than Raw by virtue of its roster, but once again, it was a case of the roster needing to come from behind to overcome bad writing for a lot of the show. Who walked away as winners and who as losers from last night's showing? This is what we should have seen from SAnitY all along. This was the feud they should have gotten into from the start. In this case, the writers made the right choice. SAnitY took what would have been a cringeworthy pancake eating contest (a segment no doubt designed for an audience of one) and made it something important. Hopefully, this feud will go on for a while and see the renewal of the New Day, who have become a one-trick pony centered entirely around pancakes. It got old months ago and the stable needs a purpose. With any luck, this feud can take the New Day back to the heights they enjoyed last year when they were feuding with the Usos, while it would allow SAnitY to make a major splash on the main roster. The clash of opposite personalities should make it work. Let's just hope the writers don't screw it up.